Where did the idea for Qreativity come from? Did you hear the one about the academic and the business brain? It was no joke. When they joined forces in 2017, anthropologist Dr. Michael Bloomfield and commercial wizard Richard Dallas decided that together they could create … well, creativity. (Actually, Qreativity.) They both felt that what the world needs now, to paraphrase Hal David and Burt Bacharach, is creativity sweet creativity, and so they set up a new kind of company – one dedicated to unlocking anyone and everyone’s creative potential. Fun fact: our brand colour, “Verdigris Q”, is a precise 50-50 blend of blue and green – the two colours scientific research has shown stimulates creativity when we’re exposed to them. Michael got into creativity when he was a teenager in search of musical Nirvana. He became obsessed with the originality of maverick genius Prince and New York art rockers Sonic Youth, whose imaginative outpourings seemed more like magic than music. His quest to write similarly brilliant songs proved so difficult (translation: he failed miserably), he eventually gave up and found another way to explore his creativity – by trying to decode creativity itself. Swept up at university in the world of anthropology, one of whose strands was to discover how we became human in the so-called “Human Revolution” perhaps a hundred thousand years ago – the mysterious transition from merely intelligent walking ape to fully cultural and symbolic human – Michael gradually realised his own path would be to try to discover how this transition occurred at the level of creative thought and behaviour. Generator Theory was to be his answer to this most epic of questions. Already fascinated by systems like yoga, mnemonics and martial arts, which appeared to have the power to equip people with virtual superpowers, Michael also set about finding a way to convert his insights into a system that could be used to increase anyone’s creative ability. Eventually, Kleytro was born. Michael has a PhD in anthropology. 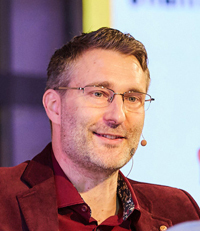 He has given numerous talks and put on extensive training programmes for organisations such as IBM, Pernod Ricard and FleishmanHillard Fishburn, and he has run Masterclasses in creative thinking for the Guardian, who has also published his ideas on creativity. We are teaching the world to speak Creative. We see creativity as a powerful force for good and want to democratise it – to make it available to anyone who wants it. We also believe that those who are already inventive and imaginative thinkers can get even better. We promote the simple yet revolutionary idea that creativity has a grammar - a grammar which can be internalised by anyone through practice. It’s all based on the only existing complete scientific theory of creativity and the only systematic method for develop your creative intelligence, both developed by Dr. Michael Bloomfield. We’re expanding globally and moving into several new commercial areas. We need partners as passionate about the power of creativity as we are. If you’re interested in collaborating, partnering or investing in us, get in touch. We’re bringing a new kind of app that we think will change the way people think about technology. For too long, technology has meant consuming pre-made content – at best, pouring good information into our heads, at worst passively digesting meaningless and trivial distractions to relieve boredom. We want your brain to be the maker of the imaginative worlds you experience. That’s what creativity is all about.